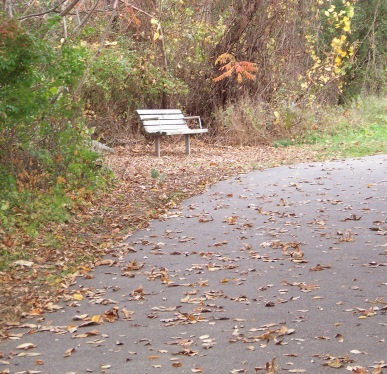 This park appeals to a wide range of outdoor enthusiasts. 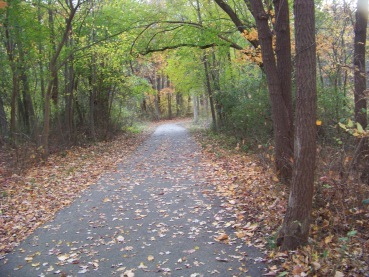 The over 1 1/2 mile paved loop around the pond is dedicated as a bike and walking path, yet it is favored by many joggers as well. Older adults looking for a steady walking surface will find it fits the bill as well. Being a paved surface, I've seen a few inline skaters glide by when I have visited this park. 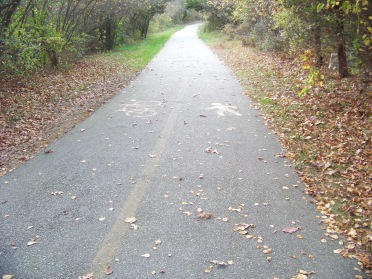 walking or riding the main trail. 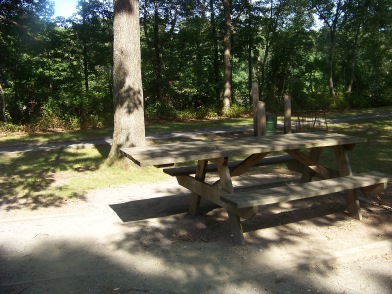 find this park without visitors! 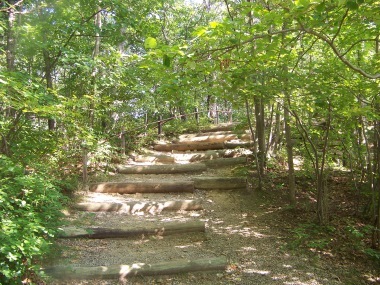 If a paved path is not your idea of hiking, there are several side trails of varying length throughout the park leading away or looping with the main paved trail. 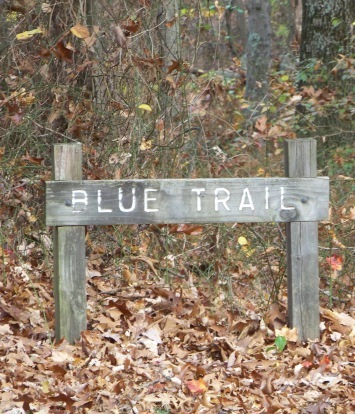 Several of these trails are named. 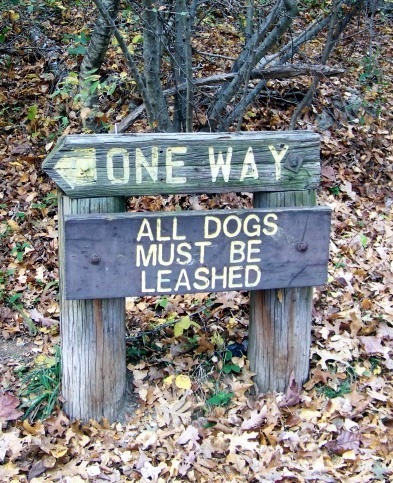 The hiking trails here are quite varied. 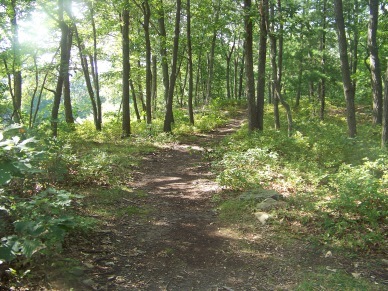 From the Braintree side the main trail immediately starts downhill. 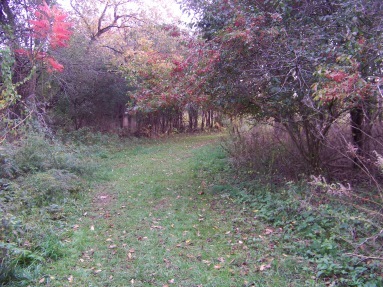 Upon reaching the loop portion that circles around the pond, the trail climbs up again considerably. If you want to avoid this hill, you can follow the car road to a point further down to either a smaller parking area or down to the dam. 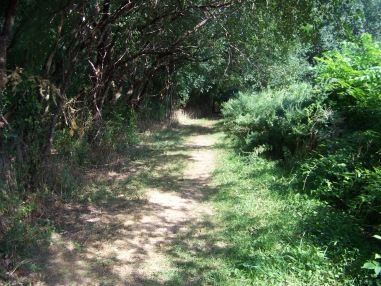 In general the walking in this park is easy, but there are a few areas that will prove a bit more challenging. As one can see there are areas that can give a bit of a rugged work out. Many of these areas though, have help getting up or down. A short almost steep climb up. Rewarded by a great view! Continuing back into the park from this side can be a little rough going. 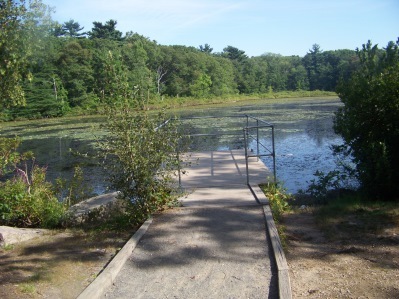 The paved trail around the pond makes the area somewhat wheelchair accessible, except for that first hill on the Braintree side. 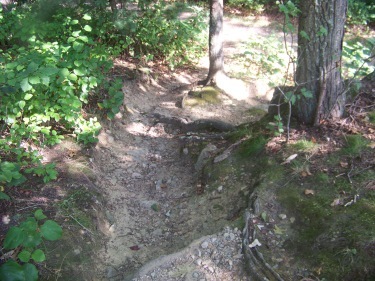 On the map, it is the area the trail runs along called the old gravel pit. The rest of the loop has mostly easy grades. 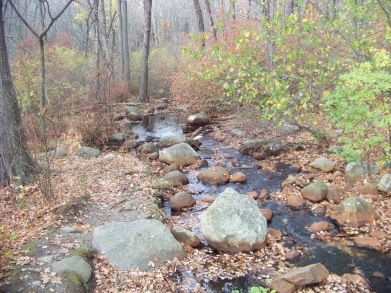 Other features of the park have helped to make it wheelchair accessible. 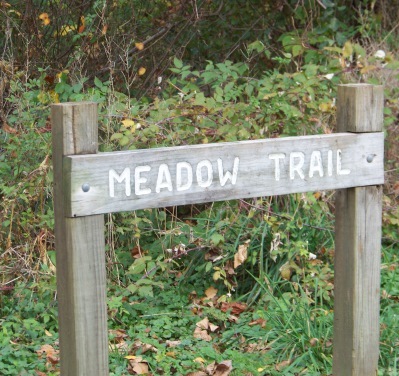 All the trails wind through a mix of forest and meadow. 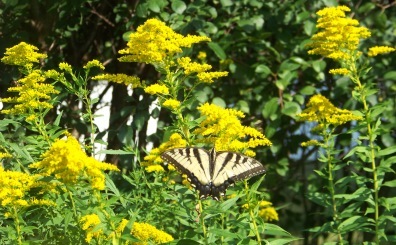 This park is home to many wild animals as it is a wonderful haven in an almost urban area. 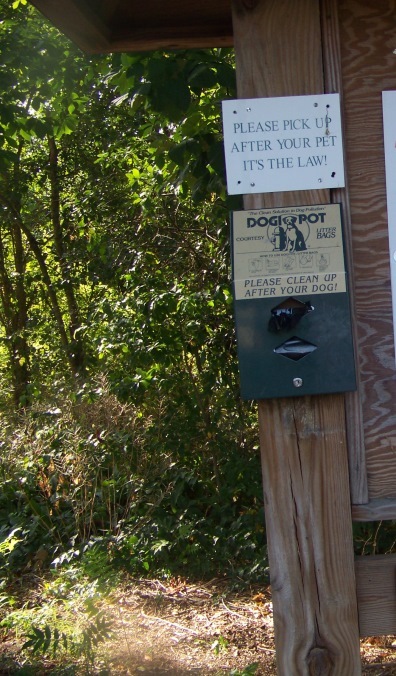 From the Braintree side you will find restrooms, drinks available from a machine, a nature center, an outside water spiket usually used to fill containers for those who bring their dogs. 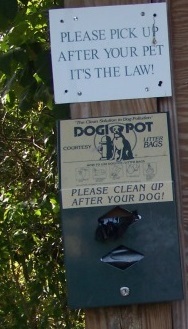 and well supplied place for dogs. 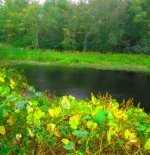 In the summer you will find blueberries growing on side trails, and any season fishing is a favorite as there are several piers and spots to cast from around the pond. 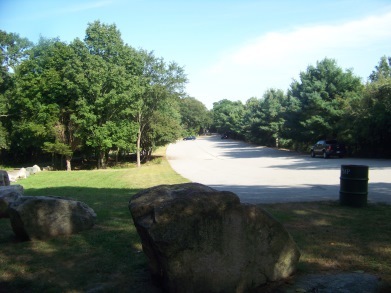 Though I have listed this park and it's hiking trails in the hiking trails of Braintree, the town of Weymouth has had a part in the developement of this park. The main entrance is located on Liberty St in Braintree. 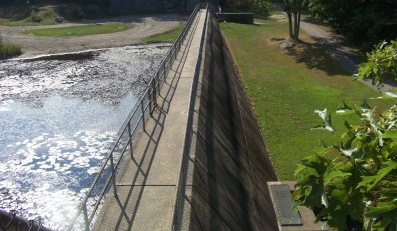 The "back" entrance is located on Summer St in Weymouth. From a look at this map in the trail quick facts to the right, one can see that most of the park does exist in the town of Braintree. 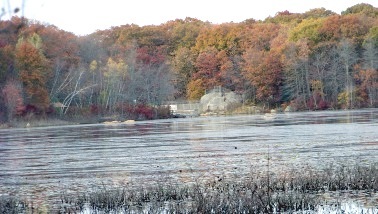 Initially the land was used for flood control. 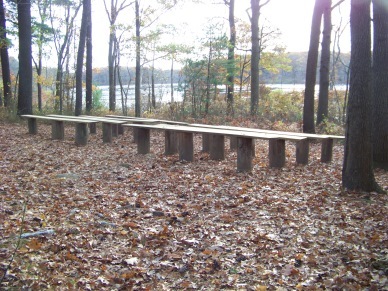 In 1972 a Weymouth/ Braintree recreation and conservation district was formed. Then the ground work for a park to be developed on the land came into place. 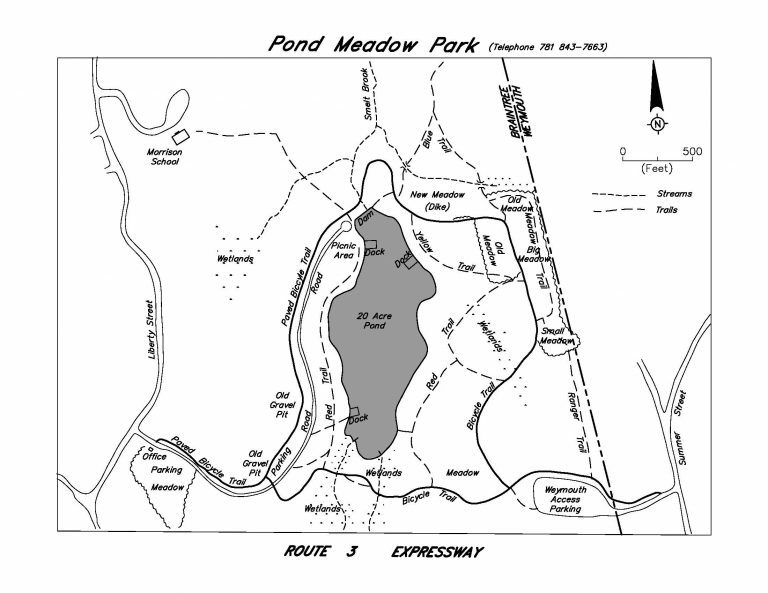 By 1974 all the land was accumulated and the present 320 acres including the 20 acre pond were set aside for the park lands. Construction of roads and the dam began. The park officially opened in 1976. 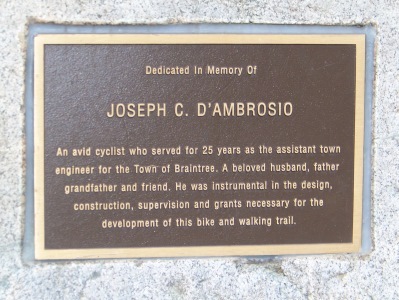 The present day bike path was constructed in 1984. There's always a rebel in the crowd! This bush I had always wanted to know it's name! It is a bush that flowers just before the blueberries mature on the bush. It is heavy with fragrance and my whole life it has been the fragrant smell that heralded the blueberry season! 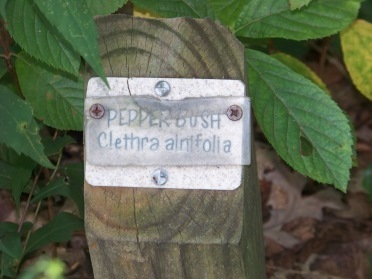 So glad that a south shore hiking trail was able to educate me on something I have always wanted to know, but didn't seem able to find the time to research! Fall is pretty nice on this trail too! 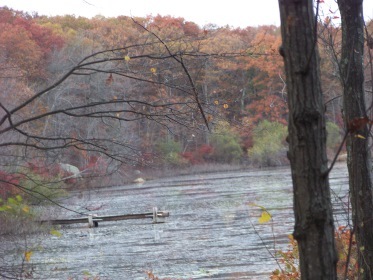 Wonderful views in any season are a constant feature at Pond Meadow Park! from exit 17 follow around rotary to Union St. heading east. At next lighted intersection with Middle St. take a right. At next small rotary take a left on Liberty St. Park entrance is on the right. from exit 16 follow route 18 south to next lighted intersection with West St. Take a right. 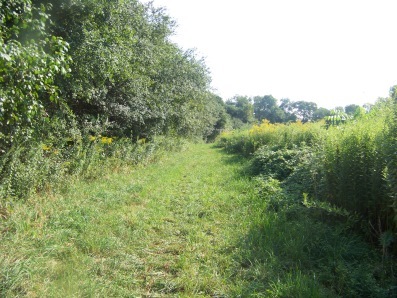 Summer St will be on the right just before the Braintree line. The entrance will be on the left immediately after the street passes under the route 3 bridge. from 45 min. around main loop to couple hours exploring many trails.